The first 4 chords are purely diatonic, therefore you just play a C-Major scale. In the second line, I replaced the G7 thru it's tritone substitution Db7. 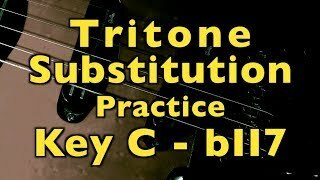 The most used scale over a tritone substitution is Mixolydian#11 (#4) what is the 4th mode of Melodic Minor. So, if you play Db-Mixolydian#11 over the Db7 chord, it's the same scale like Ab-Melodic Minor. If you can't play Ab-Melodic Minor, try Ab-Major (ionian) with a b3 (minor third), what has exactly the same notes like Ab-Melodic Minor = Db Mixolydian#11. All backing tracks are organized in playlists, so just look there first, if you're looking for something specific.